Every Augu st during her childhood, Priscilla hiked and camped with her family in state and national parks across the country establishing her love for the outdoors and our shared public resources. 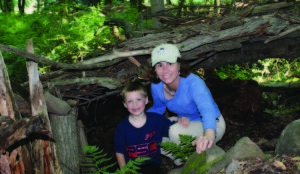 Now as the Assistant Commissioner and Director of the Division of State Parks and Recreation at the Massachusetts Department of Conservation and Recreation (DCR), she oversees the management of DCR properties spanning over 300,000 acres of land statewide from Cape Cod to the Berkshires. DCR properties encompass forests, parks, beaches, campgrounds and day use areas and afford visitors a variety of recreational opportunities. Priscilla has focused her efforts on promoting our natural resources and fostering stewardship through innovative programming, especially aimed at connecting kids to the great outdoors. She also serves on the Executive Board of the National Association of State Park Directors and works with other state park directors, the National Park Service and the National Recreation and Park Association to promote parks as critical to addressing childhood obesity. Priscilla began her career in state government in 1992 as the Assistant General Counsel for the Department of Fisheries, Wildlife and Environmental Law Enforcement. She later served as the Director for the state’s nationally recognized Community Preservation Initiative at the Executive Office of Environmental Affairs. Priscilla holds a law degree from the Northeastern School of Law, a master’s degree in government administration from the Fels Center of Government from the University of Pennsylvania and a bachelor’s degree from Connecticut College. 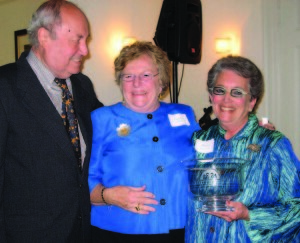 Betsy Shure Gross (right), Tupper Thomas, and Ralph P. Engle, Jr.
Betsy and her dear friend, the late Corliss Knapp Engle, were co-recipients. The two neighbors were instrumental in saving Fairsted, now a National Historic Site preserving Frederick Law Olmsted’s Brookline home, office and archives. Corliss’ husband Ralph accepted in her honor. Among Olmsted’s many wonderful accomplishments in Boston and Brookline are “The Emerald Necklace” and Franklin Park. Guest speaker for the award event was Tupper Thomas, president of the Prospect Park Alliance, a public-private partnership with the City of New York.